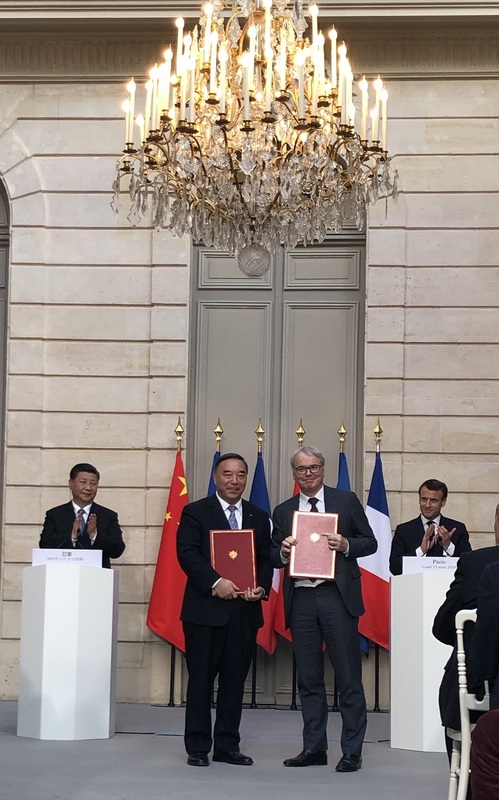 Monday, March 25, 2019, during the state visit of Chinese President Xi Jinping and in the presence of President of the French Republic Emmanuel Macron: Mr. Song Zhi Ping, President of CNBM, and Mr. Frédéric Sanchez, Chairman of Fives, signed at the Elysée Palace a “Strategic Agreement towards Climate change & Cooperation in third countries”. This agreement develops and refines, with concrete commitments, the collaboration plans drawn up in January between CNBM, the world’s leading cement plant manufacturer, and Fives, the international engineering group. It forecasts a volume of business of the order of minimum €600M over 3 years, and forms part of CNBM’s stated strategy of developing in partnership with western companies. With this agreement, CNBM is showing recognition of Fives solutions and technologies that deliver energy efficiency, reduced CO2 emissions, low water consumption and a high-quality finished product. The complementary qualities of the two groups will deliver high performance installations that respect the environment while guaranteeing production quality at an optimum price. This agreement also shows the mutual trust between the two companies, notably with respect to intellectual property. First in China, where CNBM is committed to a wide-ranging program of modernization and upgrades to its production lines. Specific projects have been identified where Fives technologies, in grinding in particular, will significantly improve performance and return on investment. And internationally, where CNBM is working on numerous projects for which the two groups will combine their expertise and technologies to create modern, high performance plants. CNBM and Fives have created a "Joint Engineering Center" to implement these projects and promote the best technologies: an exchange platform bringing together experts from both companies. The Joint Engineering Center was inaugurated on February 28 in Shanghai. This agreement is in full alignment with the Paris Agreement, and in the spirit of projects focused on the Industry of the future. It is an illustration of Franco-Chinese multilateralism, featuring balanced partnerships and mutual cooperation to deliver innovative projects in other countries.